Yearning for a casserole dish filled with enchiladas, but don’t want to fuss around with making your own Paleo tortillas? Look no further! 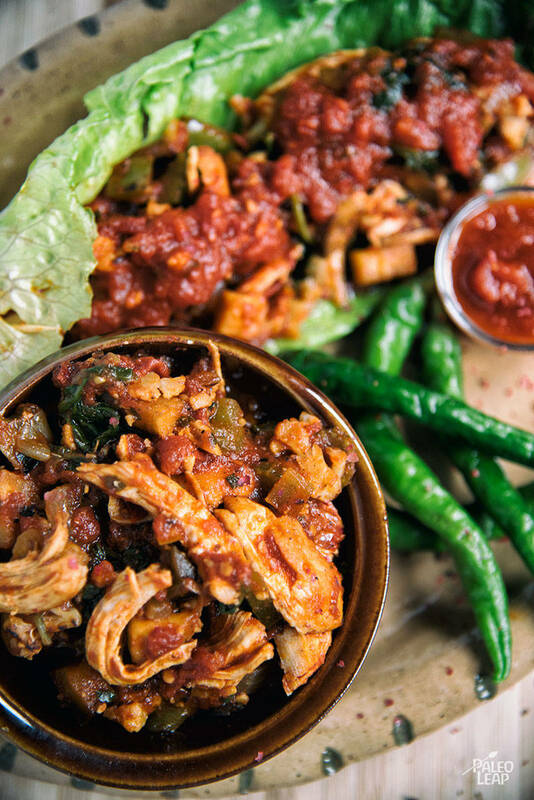 Fill your plate up with this veggie-loaded, Mexican-inspired, shredded chicken casserole with a classic tomato-based enchilada sauce. You may have bought canned enchilada sauce in the past, but like most Paleo condiments, you can make your own and they’re darn tasty! Many canned enchilada sauces have corn starch, soybean oil and other ingredients that don’t align with a Paleo template. However, with a simple can of tomato sauce and a few spices, you are ready to simmer up a batch of enchilada sauce (see ingredient list for sauce ingredients). Because this enchilada dish is cooked over the stove, and not in the oven in a casserole dish, this recipe is fairly quick to cook. When finished cooking, you can serve over a bed of cauli-rice, in a lettuce wrap, or simply scooped from a bowl. This is a great recipe to save for later – either for lunch tomorrow or frozen in single-serve containers. Cook the garlic, jalapeño, and red onion until soft and fragrant. 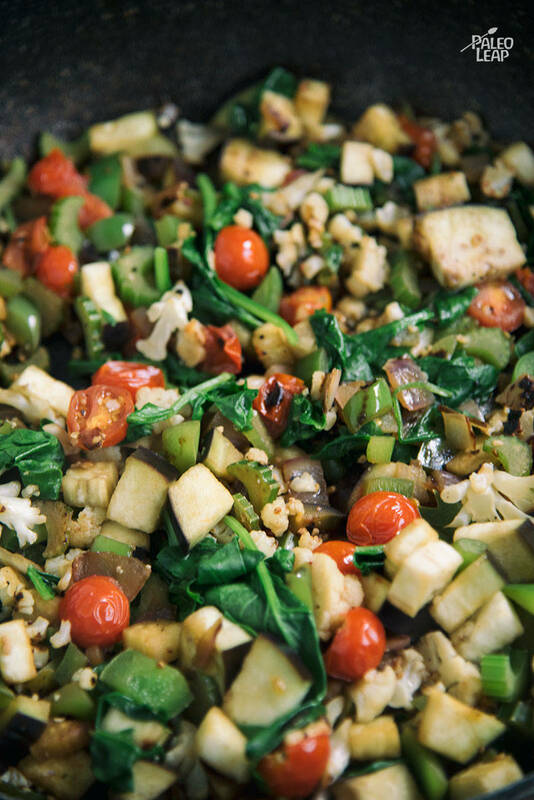 Add the cauliflower, celery, cherry tomatoes, bell pepper, eggplant, season to taste, and cook 4 to 5 minutes. Add the spinach and cook until wilted, 1 to 2 minutes. Pour in the enchilada sauce, cumin, and shredded chicken; toss everything gently. Cook until warmed 4 to 5 minutes, serve with fresh cilantro.